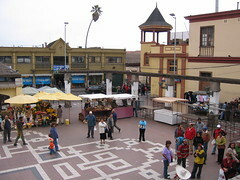 The plaza in front of La Recova, the largest crafts market in La Serena. In a recent trip I visited La Serena, which is the capital of Chile’s fourth region, Coquimbo. It’s a small, attractive city on the coast that looks like a transplant from colonial times. In fact, it is. La Serena was built (again—the city had an unfortunate history of being destroyed) by Spanish settlers in 1549 and current laws require that new buildings maintain the old style. The downtown area has no fewer than 29 churches, a quantity that one is hard pressed to find a use for. La Serena is also known for its multitude of crafts markets. The largest market is La Recova, where Elizabeth and I spent a couple hours eating lunch (fresh seafood! ), browsing through artisans’ stands, and shopping for her family. 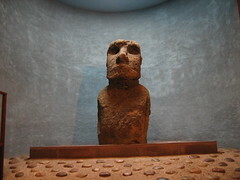 One of the precious few moai that have been taken from Easter Island! I admit, I had seen plenty of pictures of moai before seeing this one in person, but seeing one in real life is bizarre. Elizabeth and I took pictures and posed with the statue. As the only two people in the entire museum, we had this iconic statue to ourselves. In recent years, La Serena has become the hot summer beach destination. The oceanfront is lined with hotels, and cabanas, though no higher than 5 stories because of the building laws I mentioned. 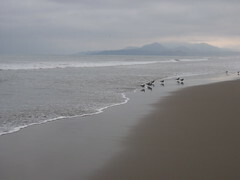 As we visited not in the hot summer tourist season, but in the wintry fall, the beach was practically deserted. But we imagined it being hot and sunny. I got the impression that this town would be a fun summer destination. What’s the population of La Serena? I’d be interested to know how many churches there are per capita there. Your post inspired me to find out how many churches were in San Francisco. I discovered there are 48 Catholic Churches in the city of San Francisco! I was a little surprised to learn that there were so many. I have no idea how many churches there are including other denominations. Of course, the population of San Francisco is about 750,000 - likely more than that of La Serena. To answer your question, Lance, I decided to check my facts and I found conflicting numbers. I have to admit that I didn’t visit each of La Serena’s 29 churches myself—I took the figure from the Rough Guide to Chile which was pretty reliable in other matters. But a tourism site says 27 churches; a Catholic site reports 20 in the city, with 145 churches and chapels in the diocese of La Serena. Let’s just go with 27 for now: La Serena’s has a population of 147,815 according to the 2002 census, and gives a density of 1 church per 5,500 people.